You have just discovered an effective way to migrate customer support data to Zendesk. See how our import tool can save your time and resources. Your information is safe with us and used solely for the data import. Benefit from a super easy and quick import process. Move Tickets along with other essential types of records and knowledge base articles. Our service was designed to bring you an easy to use import tool that gets the work done. 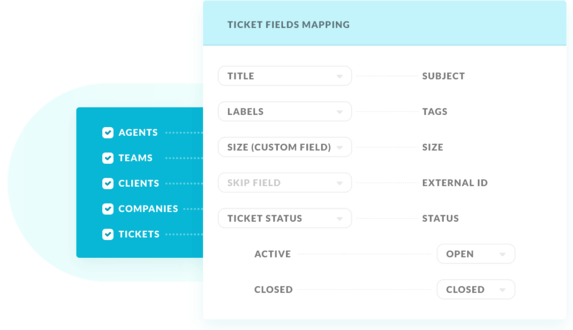 All tickets will be imported to Zendesk with their corresponding agents, contacts, and attachments, that way, saving the record of customers' requests. Register and start off your Zendesk import. Grant the right to access your Zendesk account. Make a decision on which records need to move and which have to stay. Import a limited amount of information to see our service in action. No strings attached.